Arrive in Buenos Aires, the “Paris of South America.” This cosmopolitan city is constantly aglow with European-influenced culture, vibrant sounds and colors, and a distinctly Latin vibe. Countless museums, tree-lined boulevards, and great shopping await during the day. 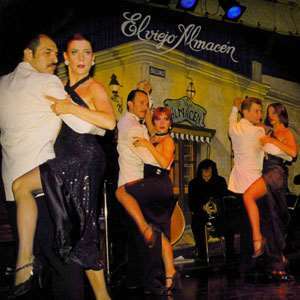 Tango shows, live music, great food, and a surging nightlife await in the evenings. Your hotel is available for mid-afternoon check-in. Today your city TOUR focuses on the culture and history originating from the Spanish colonizers four centuries ago. It includes a visit to the oldest part of the city with its archaeological remains of ancient buildings and ruins of San Francisco Church. Also visit the new city, Plaza Independencia, the Civic Center, and General San Martin Park with its lake and rose garden. 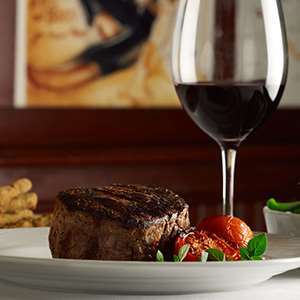 Mendoza has gained worldwide recognition for its production of award-winning wines, and is the most prolific wine-making region in South America. Learn more about the industry and Mendoza’s famous Malbec on today’s BODEGA TOUR. Travel into Mendoza’s agricultural oasis, where you have the opportunity to visit two different vineyards, learn about the wine-making process, and participate in wine tastings. After time at leisure this morning, transfer to the airport for your flight to back to Buenos Aires, where you’ll have the evening free to do a little exploration of this great city. After breakfast, your PRIVATE CITY TOUR takes you along the widest avenue in the world to see the Colon Theatre, the pride of Buenos Aires. You’ll also visit the Avenida de Mayo and Plaza de Mayo, surrounded by La Casa Rosada (the President’s Pink House), and the Cabildo, which was the first City Hall. Visit the METROPOLITAN CATHEDRAL, which houses San Martin’s Mausoleum and is a center for religious celebrations. Continue to the oldest district in Buenos Aires, San Telmo, where you can find dozens of little shops around the main plaza, then stop by colorful La Boca and Palermo. 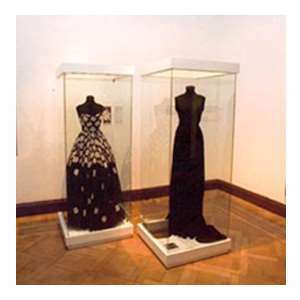 Finish your city tour with a visit to the CEMETERY of the Recoleta, burial site of Eva Perón and a highlight of the city. This evening, you may opt to enjoy dinner and a traditional Tango show—Argentina’s most sensual dance. Today is free to explore this extraordinary city. 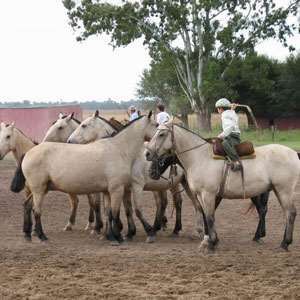 Consider joining an optional excursion to visit a traditional estancia (ranch) to experience the lifestyle of the gauchos, or cruise down the Tigre River surrounded by beautiful landscapes and impressive homes. Get ready for your next adventure: Patagonia! Fly to Bariloche, an impressive settlement in the Patagonian Andes foothills whose beauty is comparable to the Swiss Alps. In addition to dozens of outdoor activities and great tourism facilities, Bariloche is also famous for its chocolate, local beer, and European-influenced delicacies. Today, you’ll have the opportunity to become acquainted with this charming destination by PANORAMIC TOUR. Wind through the mountain roads of Bariloche, enjoying the scenery of its various forests and lakes. You’ll travel by chairlift to the summit of Cerro Campanario for breathtaking views of the city, lakes Nahuel Huapi and Moreno, St. Peter’s Peninsula, Llao Llao, and more. After visiting the summit you’ll have the chance to see the Llao Llao Hotel and its chapel up close—both architectural gems. Keep your camera ready, as opportunities to take photos are around every corner. Enjoy your evening at leisure to explore the charming city squares, many shops, and great restaurants. Enjoy your day at leisure. Perhaps journey to Victoria Island in the middle of Nahuel Huapi Lake and visit the pure and exotic native trees of the Arrayanes Forest—or spend time in Bariloche, relaxing at your hotel and exploring the town. Fly to El Calafate in the southern region of Patagonia, neighbor to Los Glaciares National Park, a UNESCO World Heritage Site. 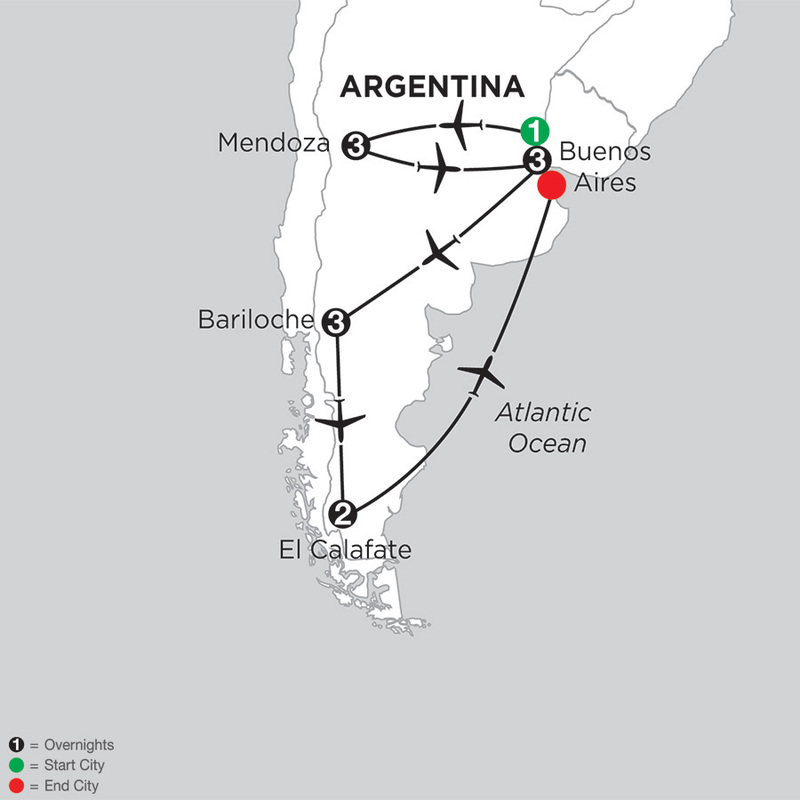 Today, journey into LOS GLACIARES NATIONAL PARK to see one of the world’s natural wonders—PERITO MORENO GLACIER. The glacier forms part of the Patagonian Continental Ice Field, from which 13 other glaciers descend on the Atlantic side to flow into the Viedma and Argentino Lakes. More than three miles wide and 260 feet high above Argentino Lake, Perito Moreno is one of the few glaciers in the world that is still advancing. Walk on the platforms and balconies in front of the glacier for a chance to view one of the continuous calves of its frozen walls. 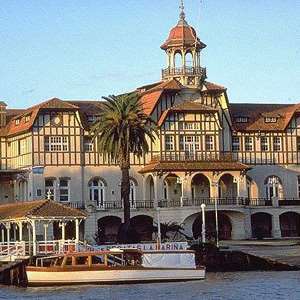 Transfer to the airport for your return flight to Buenos Aires. Your private transfer from the domestic airport to the international airport is included in the vacation price. Kosten Aike Hotel in El Calafate is on the edge of the extensive and mysterious Patagonian plateau, on the foot of the imposing mountain range of the Andes and in front of the majestic National Park the Glaciers. Amenities include a restaurant, gym, spa, playroom, business center, room service, laundry, and recreated ancestral Tehuelche designs throughout the hotel by prominent Argentine artists. Conveniently located in downtown El Calafate. This hotel features 80 guestrooms equipped with heating, safety deposit box, telephone, cable TV, and Internet access. Monograms provides travelers access to a Local Host®, so you will have someone on hand to answer those vacation questions pertaining to El Calafate. No waiting in line at the concierge desk or trying to ask your waitress at breakfast directions to the shopping district. Simply ask your Local Host about El Calafate and you'll be on your way in no time. Plus, your Local Host will share local El Calafate insights and share suggestions for getting off the beaten path, leaving you more time to create lasting vacation memories that are yours alone. The first museum in South America dedicated to the glaciers and Patagonia ice. It has a privileged location, situated close to El Calafate town (20-minute drive). The whole complex is a last generation interpretation center, which offers visitors an interactive exhibition with the aim to learn about the glaciers – investigations, scenic & lighting effects, multimedia programs and audiovisuals. It also features a permanent exhibition focused on global climate changes and the environmental issues. You can even enjoy a drink at the Glacio-Bar, the first Ice Bar in Argentina, a unique and fun way to welcome you to El Calafate – have a drink surrounded by ice! Allow 3-4 hours for this activity.